Today online term insurance plans are available at very low cost. It will cost you even less than your monthly mobile bill. So, if you have not taken life insurance yet it is advisable to go for an online term insurance plan. A term insurance plan provides a risk coverage and financial stability to your family in your absence. Online term insurance policy is 20-40% less costly compare to offline policy. The reason why there is big cost difference is between online and offline term plans are given below. As online term plan is purchased directly no intermediate agent is involved in between. So you will be saving big money on insurance agent commission. You may not be aware but agent takes 15-20% commission on every insurance payment. A mortality risk (unknown or hidden risk) associated with online term plan is almost zero because people who opt for online term plan are usually well educated and they are expected to take good care of their health so the insurance company is willing to provide them term plan at lower cost. A paperless process so further reduction in overall cost of policy. You can purchase online term insurance plan in following two ways. Direct Online purchase – In this case you approach the insurance company directly from the insurance company website and purchase the policy online. No agent is involved and the entire process is completely transparent. Purchase from Insurance Web Aggregator – You can also purchase online term insurance plan from insurance web aggregator. Insurance Web Aggregator is web portal or search utility approved by IRDA. Insurance aggregator website provides you facility to compare several insurance policies and helps you to get the best deal. In this process also no agent is involved and the entire process is transparent. From above comparison, it is quite clear that if you are intended to buy online term plan or any insurance policy you should use Insurance web aggregator website. Insurance aggregator method is the best way to buy online term plan as it will help you to take an informed decision. 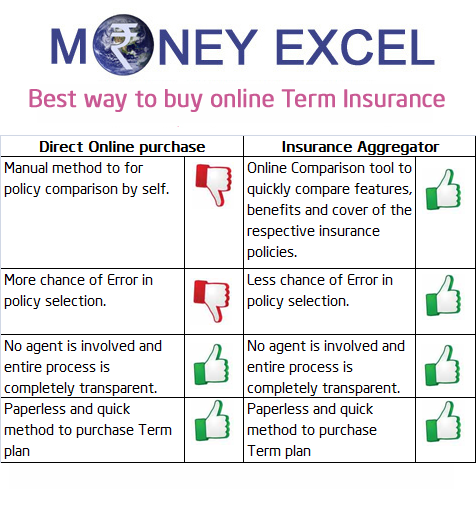 How to purchase online term plan from web aggregator? Visit the web aggregator website from where you wish to purchase your policy. Provide your details like your name, address, date of birth, sum assured, email address, mobile number, city, smoking habits etc. Press the ‘Continue’ button and you will get various term plan options along with premium and feature detail. Select appropriate term plan and make premium payment using Net banking, Debit Card or Credit Card. On completion of premium payment, the insurance company will send policy document. Congratulation now you are insured. Well, apart from online term plan you can also purchase car insurance, health insurance, money back policy, child insurance plan, travel insurance from aggregator website. How insurance web aggregators make money? Insurance web aggregators are not an agent and they don’t even take referral fees from the insurance company. So, how they make money? As per IRDA guideline insurance aggregators are authorized to charge a flat fee not exceeding fifty thousand per year towards each product displayed by the web aggregator in the comparison charts of its website. So the point here is they are not getting any benefit if you buy a policy from them or not. Online term plan offers you multiple benefits including cost saving. So, always purchase term insurance policy online. You should keep certain important factors in mind before purchasing term plan such as sum assured, income, future expense, riders etc. In order to help you here is comparison chart of Best Term Insurance Policy. Remember – Buying term plan is an important decision of your life. Be cautious and purchase best term insurance policy based on your requirement. How important is the claim settlement ratio when selecting an online term plan? As per the IRDAI table, LIC is at top, Max Life is at 2nd position with 96+%. What should be the minimum claim settlement ratio to make that plan a good plan? Very good question.A claim settlement ratio is one of the factors in rating insurance companies. Higher the claim settlement ratio means insurance company is trustworthy and reliable, whereas the low ratio indicates that the insurance company is less reliable in the claim settlement.Use claim settlement ratio as one of the factors while buying an insurance policy. CSR should not be the only factor for deciding Life Insurance Company. There is no thumb rule in deciding good plan based on claim settlement ratio.However, as per me CSR should be 90% or above. Under Section 45 of the Insurance Laws (Amendment) Ordinance, As per the Section 45 of the Insurance Laws (Amendment) Ordinance, no policy can be called into question after three years of it being into force.This means, the insurer has a three-year window to reject claims on grounds of any mis-statement or fraud.This rule was made to reduce industry-wide losses due to fake claims. CSR is still important in a manner that if death take place within 3 years from date of taking policy claim can be rejected. CSR one of the last factor to consider while buying insurance policy. My sister is a divorcee & having a daughter. She is doing some small time job instead of sitting in home. Can you suggest A Term Insurance Plan or any other insurance plan for Single mother, So that it will be a support for her daughter in future. I have heard that buying term plan online is bad because at the time of claim, the survivor has to run around for getting the claim settled. But if you buy through agent, they manage the entire process for you. Is that true? Which companies are notorious for poor record when it omes to claims settlement and survivor harassment? You are absolutely wrong.You can refer to claim settlement ratio. In addition to that please note that as per IRDA rule Life Insurance Company can not reject Insurance claim after 3 years. You should buy a Term plan. Please look at ICICI iProtect Smart or HDFC Click2protect plus.